TOKYO — North Korean leader Kim Jong Un appears to be trying out a new tactic to boost the image of his authoritarian regime — he's putting the spotlight on the women in his life. 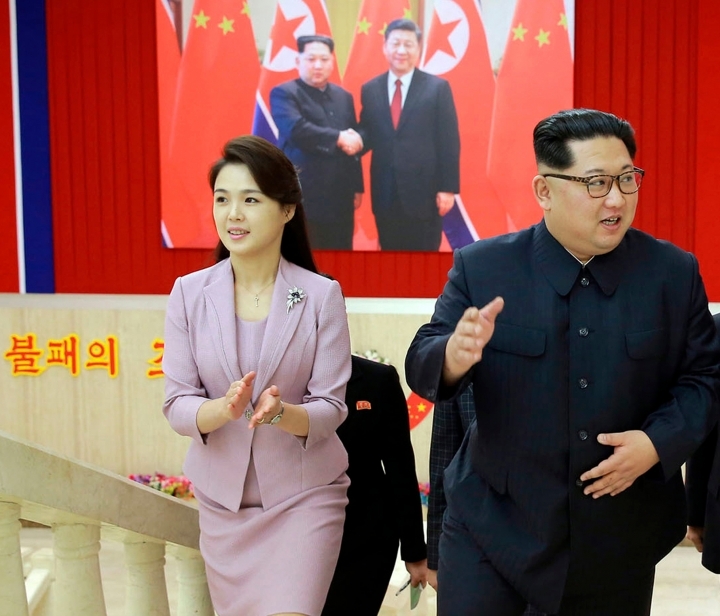 But the greater public role for Kim Yo Jong, his sister, and Ri Sol Ju, his wife, comes as Kim is embarking on a "charm offensive" — a series of summits and diplomatic moves that have significantly raised his international profile. The timing suggests he's hoping to change the optics of his regime, if not its iron-fisted domestic policies, by presenting a softer face to the outside world. The new look may be on display again later this month, when Kim is to sit down for his first summit with South Korean President Moon Jae-in. South Korean media suggest Kim is planning to bring his wife to the April 27 meeting on the south side of the Demilitarized Zone that divides the two nations. If he does, it would be in keeping with the North's new normal. Ri accompanied Kim on his surprise trip to China for a summit with President Xi Jinping last month and was seen looking quite stylish as she beamed beside him at state functions. After Moon, Kim is scheduled to meet with President Donald Trump in May or June, raising the possibility of a click-bait bonanza — Ri meeting her U.S. counterpart, Melania Trump. But the time for that much exposure might not be quite ripe. North Korea has a somewhat complicated relationship with the first lady concept. Kim's grandfather and father both had multiple significant others, and personal matters involving members of the Kim family are treated with the utmost discretion by the North's propaganda machine. Even so, Ri would seem to be a natural for the part. She is poised, comfortable in the limelight and usually dressed in expensive outfits. 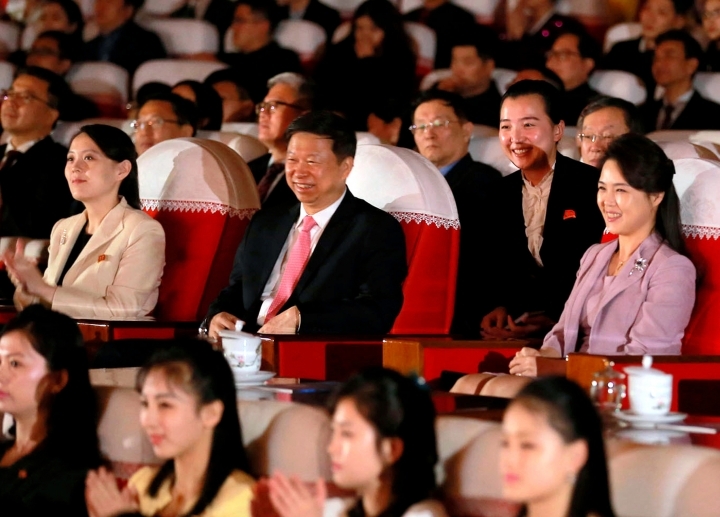 She trained in the performing arts from a young age, singing with the Unhasu Orchestra before she and Kim married, reportedly in 2009 or 2010, the year before Kim assumed power. A singer herself, it's believed she is close to the members of North Korea's all-female pop group, the Moranbong Band, another Kim Jong Un creation. Ri was among a select group of young women dispatched to South Korea to cheer for North Korea's team at the 2005 Asian Athletics Championships, suggesting she comes from a family in good standing. She's believed to be 28 years old. Little else is known about her. Unlike Kim's father — the identity of his mother was long kept a state secret — Kim has appeared with his wife fairly frequently since their first official outing together, to an amusement park in 2012. She was with him when former NBA star Dennis Rodman serenaded Kim with a birthday song before an exhibition basketball game in 2014. A few extended absences were likely due to pregnancies. She and Kim reportedly have three children, though that, too, has never been officially confirmed. Her real anointment may have come this week, when she was bestowed with a new honorific — "revered first lady." According to South Korea's Chosun Ilbo newspaper, that hasn't been used by the North's state media since 1974, when it referred to national founder Kim Il Sung's second wife, Kim Song Ae. Previously, she was simply "comrade Ri." Kim's younger sister, meanwhile, has also entered the stage in a big way. 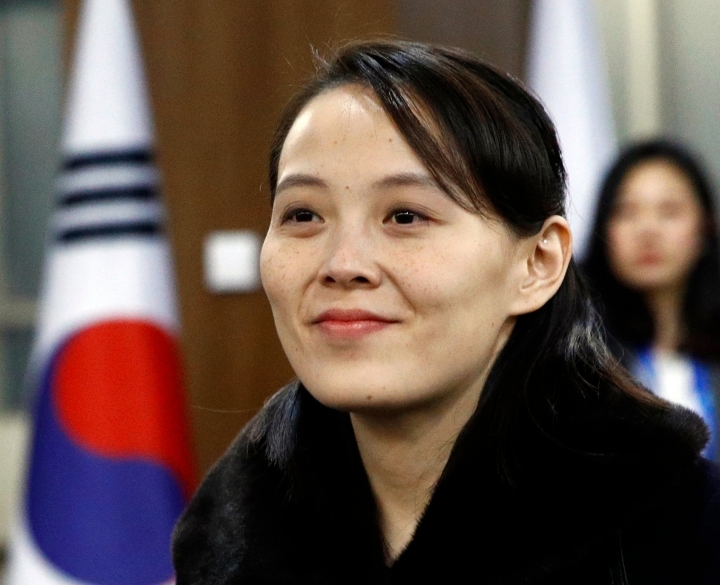 Her coming-out party came in February, when she became the first member of the North's Kim dynasty to travel to South Korea, for the opening ceremony of the Olympics. She quickly proceeded to steal the show, looking almost regal as she held court with South Korean President Moon and other international dignitaries. In one of the Games' most telling moments, Moon stood to shake her hand as a joint North-South team entered Olympic Stadium while U.S. Vice President Mike Pence, who was also in the VIP box, sat stone-faced nearby. 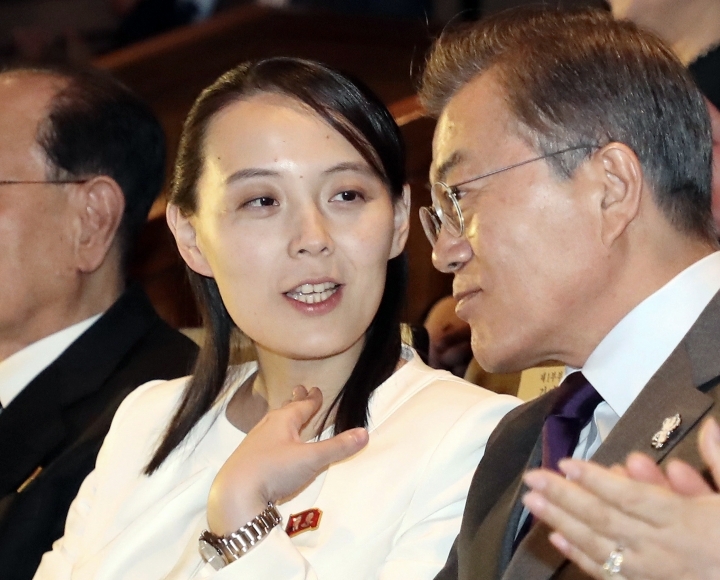 At 30, Kim Yo Jong could well be her brother's closest confidant, a role reminiscent of the relationship between Kim Jong Un's father, Kim Jong Il, and his aunt, Kim Kyong Hui. She and Kim Jong Un lived in Switzerland in relative isolation for several years as children. An alternate to the ruling party's powerful politburo since October last year, she is believed to be in charge of maintaining her brother's public image and cult of personality. Her public appearances before Pyeongchang were limited to occasional events where she was seen serving her brother. With her name almost never mentioned in the state media, and never with an explanation of her pedigree, it's quite possible that until news of the Olympic visit was aired, most North Koreans had no idea who she was. That's certainly not so any longer. Her return from the South was front-page news, as was her place right beside her brother when a senior South Korean delegation made a follow-up visit in March. On Sunday, she and wife Ri — looking as glamorous as ever — were back in the pages of the ruling party newspaper greeting a senior Chinese delegation and watching a performance of Giselle by China's national ballet the night before. That was also something of a landmark. It was possibly the only time the "revered first lady" has been featured by the state media attending an event without Kim Jong Un by her side.